Southend 10K – I survived it! Okay. 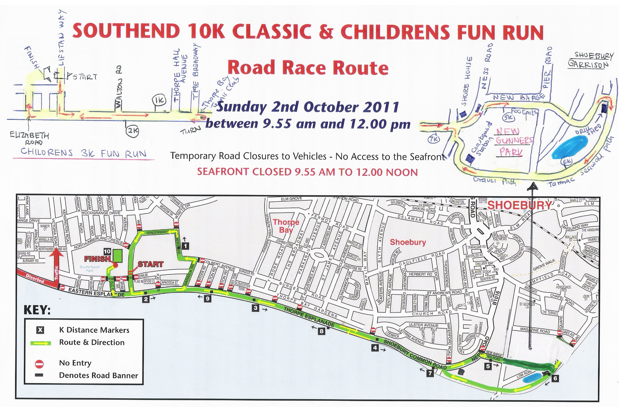 So a quick blog about the Southend 10K road race that I took part in today. 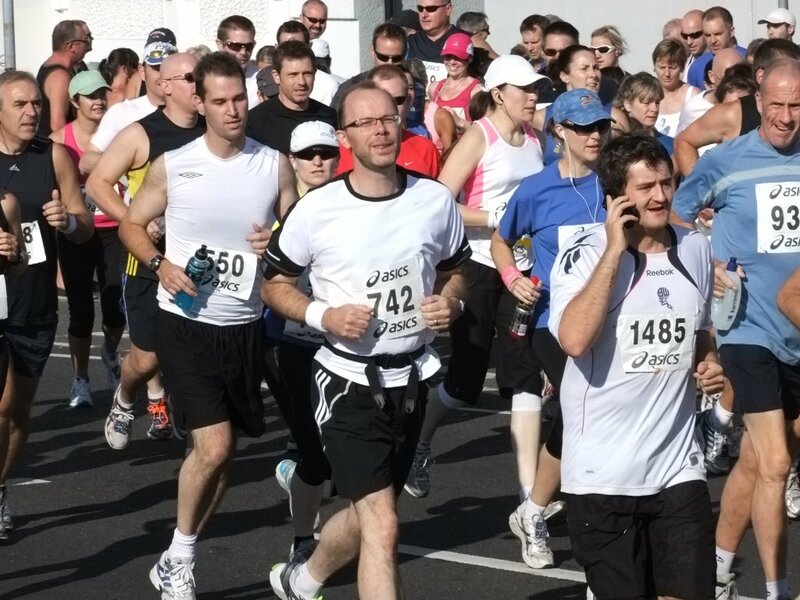 I was runnning in aid of Havens Hospices and if you wish to donate to the cause and support my efforts then you can do so here. Back in April/May I decided I needed to get fit and lose weight and to that end started eating sensibly and exercising more and I took up running. Ialso cycle, play golf, play badminton and much else besides – but running has been the main focus this year. 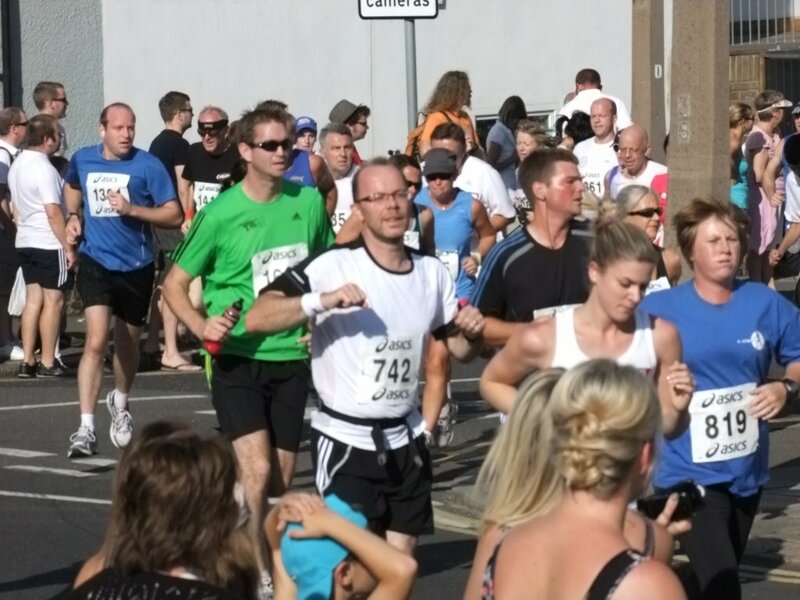 It set myself the goal of taking part in the Southend 10K and duly entered. So throughout the summer I have been running on average twice and week and often three times a week and I have to admit to have been enjoying it. Not sure how I’ll do in to the winter but we’ll see. If you are interested I track my running and cycling (mainly) on Runkeeper and use their excellent Android App to do GPS (when it works on my phone) records of my runs and cycles. You can find my page by clicking below. So two weeks ago I got a stinking cold and so I have not been running much for a couple of weeks. This may actually have helped. I still have the last knocking of the cold but fortunately was well enough to take part today. I got there fairly early – dropped off by the family who were there to support – and despite living only 10 mins away needed the loo immediately due to the amount of water I had drunk. The queue was lengthy and it took 20 mins. Evacuation complete I joined the massed throngs of runners in mid pack around the 1 hour time mark. It seemed to me there were loads of people – but not many at all compared with the London Marathon and the Great North Run. The race started at just gone 10.30 and a few months of training was gone in a blink and we were off. A map of the route is included below. 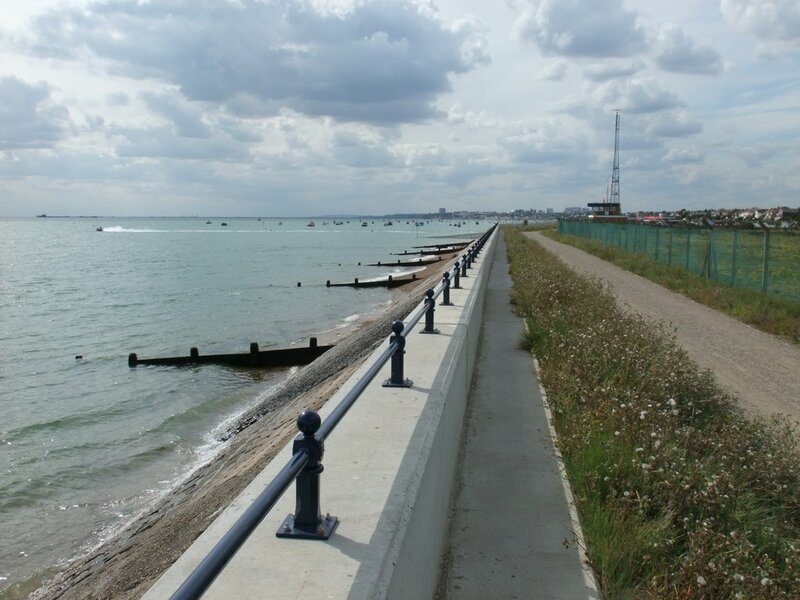 Basically we started in Liftspan Way next to Southchurch Park and then after a quick 1.5K circuit of some local roads were ran up the seafront to The Shorehouse pub then onto the Garrison land using some new paths before turning back behind the sea wall to the Coastguard station. From there we returned to Southchurch Park back along the seafront. I started well in a big group and probably went off a bit quick if I’m honest. I was however not running with my usual equipment and so was not as comfortable as I should have been. Normally I run listening to music on my phone with earplugs and with the Runkeeper app telling me my distance and pace every 0.25km. I decided not to do this today (and partly the gps was playing up) and instead relied upon the distance markers and a lap timer stopwatch on my watch. A big problem with this was that some of the km markers were missing. I think 1,2 and 3 were there but 4 was missing (or I just missed it but dont think so) and I think 7 was missing too. This did not help with the motivation. I recorded the first 3 km times at 5:27, 5:53 and 4:54 but then get in a muddle for 4 and 5. 6 to 9 were 6:19, 6:37, 6:33 and 6:26 respectively. The intial loop went fine as did the run up the seafront to The Shorehouse. 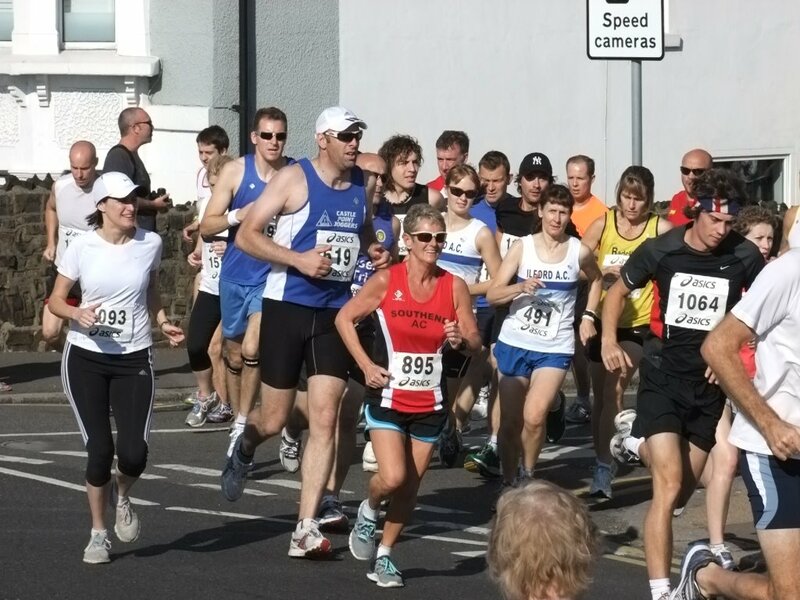 It was demotivating when I neared The Shorehouse to see the elite runners coming back down the seafront and equally demotivating to see the 1.5km out and back around the Garrison land. The Garrison bit out to the turn was okay but the return along the sea wall was on loose surface which I didn’t like. This was around 6km and where I stopped running for the first time and had the first of rather too many short walks. The photo below taken a few weeks ago shows you what I mean about the surface. Returning down the seafront was tough but thankfully the sun was now behind and a bit of breeze cooled us a little. 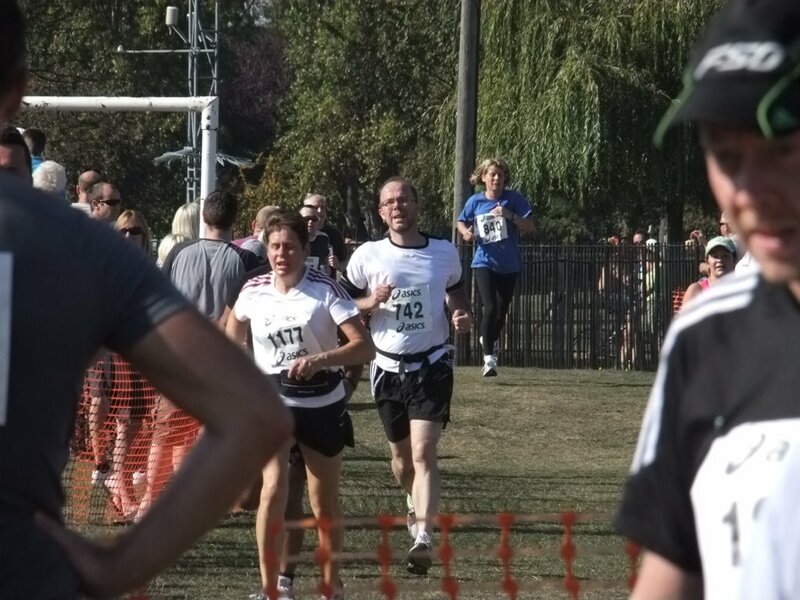 The final turn into Southchurch Park eventually arrived and looking at my watch I noted the time was 58 mins + at which point I realised I was unlikely to manage to finish under the 1 hour target. Desperate to try, I sprinted the last 300m and into the park where I saw a time clock and thought I had finished. Unfortunately this was not the finish and having decelerated I then had to pick up again and dash for the line. In the end I finished 17 seconds over the hour. I was elated to have finished the race in a good time but disappointed not to have finished inside the 1 hr target. That said it was really very hot and I wanted to finish more than I wanted to achieve the fast time so it was the sensible thing to have some walks along the way. I guess had the temperature been 10 degrees less then the 1 hr mark would have been bettered. It took me a while to recover at the finish – but recover I did – and I did also manage to get a free massage to the legs thanks to the guys at Excel (who I will be checking out incidentally for some further fitness stuff). So my final time by my watch – and my first PB for a 10K was 60:17. 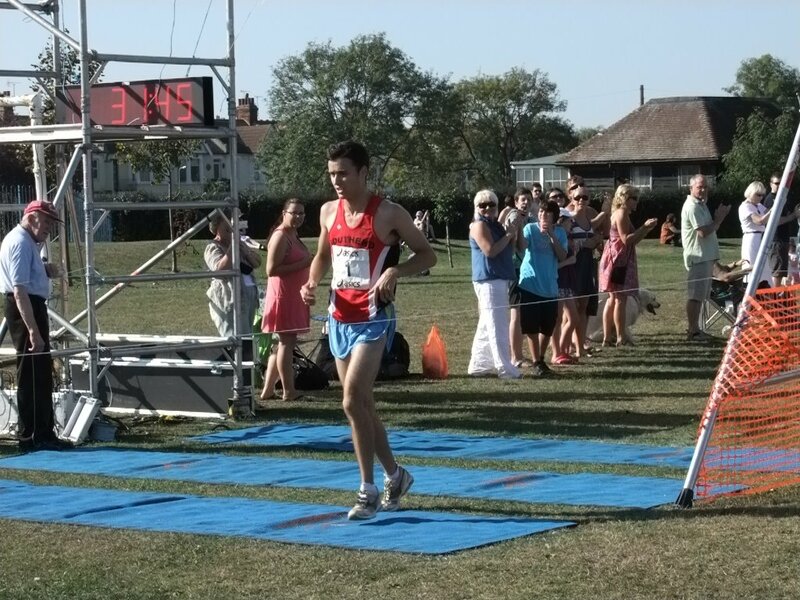 The full chip timing results are now available here and my chip time was 61:18 which is a good agreement with my timing. I finished 873rd out of 1332 finishers listed and was 648th man and 231st in the M40 class. I’m well pleased with that! My family were there supporting and my teenage daughter was armed with my camera and took nearly 1,000 photos. A selection of photos can be found in two albums on my Picasaweb photo sharing website here and here. If you see yourself and would like bigger and copyright free photos then let me know on Noynek99@gmail.com and I’ll email you. A few photos including ones of me are included below. All open into new windows. Thanks for reading. Leave a comment below if you wish, and take part next year – I will! Running clubs were well represented. Yours truly shortly after the start - number 742. Yours truly after the first loop. The winner crossing the line. 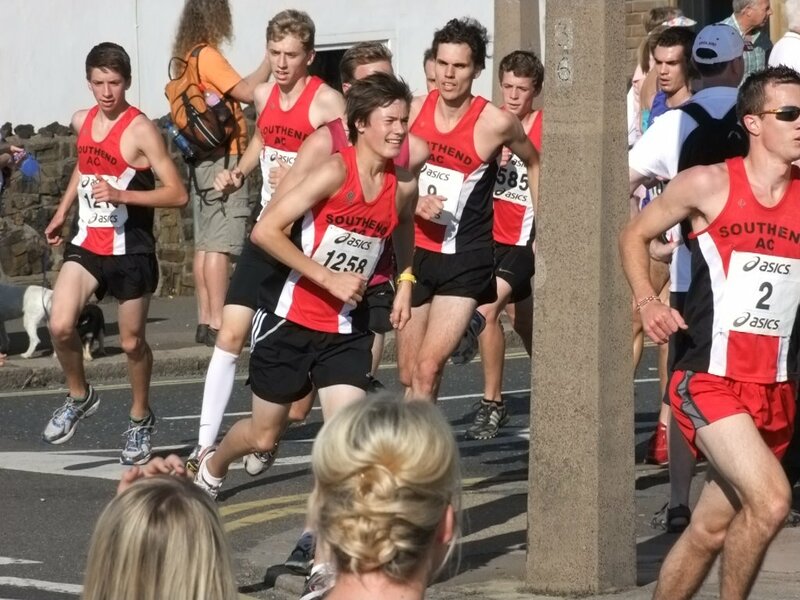 Another of the elite runners crossing the finish. Yours truly approaching the finish line (eventually). Thanks Di. Doing it again this year. Hoping for around 50 mins. Weather looks much better this year 🙂 Have a good one.